Hot off the presses, here's the poster for Andy Briggs' 3D action adventure film LEGENDARY, set in the world of 'Cryptozoology'. The film follows Travis Preston, our heroic cryptozoologist, as he is called to investigate a series of unexplained deaths at a remote construction site. Rumours abound that the cause is a legendary lake monster. Preston, in competition with the ruthless Harker, struggles to prove the monster is more than myth. As the death toll mounts, Preston's suspicions are confirmed: not only is the beast real, but it preys on human flesh. The film stars action legend Dolph Lundgren (Rocky IV, The Expendables) and Scott Adkins (The Expendables 2, The Bourne Ultimatum) is directed by Eric Styles (Relative Values, True True Lie). It is produced by Midsummer Films, and is due for release later this year. Shooting on Andy Briggs' $12 million 3D action movie LEGENDARY: TOMB OF THE DRAGON is well under way, and some excellent photos have come back from the set. Last month the cast and crew held a launch ceremony for the production in Beijing (you can find all the images here) and since then we've received great photos of stars Scott Adkins and Dolph Lundgren filming out in China, which can be seen below. LEGENDARY, directed by Eric Styles (Relative Values, True True Lie), sees cryptozoologist Travis Preston travel to China to investigate a series of mysterious killings that might or might not involve a legendary beast. 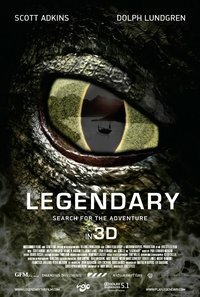 Andy Briggs' 3D action adventure film LEGENDARY, set in the world of 'Cryptozoology', went into production this month. The film stars action legend Dolph Lundgren (Rocky IV, The Expendables) and Scott Adkins (The Expendables 2, The Bourne Ultimatum) is directed by Eric Styles (Relative Values, True True Lie). It is slated for a 2013 release. It is produced by Midsummer Films.